Welcome to the VESF e.V. The VESF e.V. 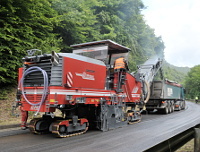 (Association of European Road Milling Enterprises) regards itself as an advocacy group of milling contractors and companies whose core business is closely linked to road and soil milling. Our members therefore include mainly performing companies but also renowned road milling machine manufacturers as well as manufacturers of cutting tools and other wearing parts. Our activities focus on the exchange of ideas and information among the member companies on new methods and opportunities, trends and developments. We also attend national and international panels, participating in the debate on, for example, matters relating to occupational health and safety or transport issues. Twice each year, the members of the VESF come together for a general meeting to discuss current issues and to present new products and innovative solutions. If possible, the meeting is combined with an excursion to companies or construction sites worth visiting. Click here to learn where the next general meeting will be held. Guests are always welcome. The operation of cold milling machines requires attention to many technical details which can have a significant influence on the working result. Click here to learn more about the cold milling technology and the operating principle of cold milling machines. Even highly challenging jobs can be completed to precision with the right machine, suitable levelling technology and correct milling drums and cutting tools. Our members currently include around 50 renowned companies from Austria, Belgium, France, Germany, Great Britain, Italy, Luxemburg, Netherlands, Norway, Switzerland and the USA. Click here to see the contact details of our member companies. Read our press releases here. Learn what’s new at the VESF and what we think about current issues.